From the guru of Shri Nisargadatta Maharaj and Shri Ranjit Maharaj, a masterpiece of spiritual teachings from Shri Siddharameshwar Maharaj. 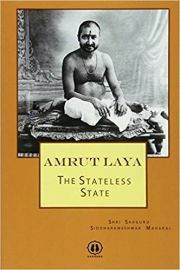 Contained within this book are newly revised editions of Amrut Laya - Volumes 1 and 2. Also contained within this book is the great work of distinction authored by Shri Siddharameshwar Maharaj titled "Master Key to Self-Realization." Volume 1 of Amrut Laya is comprised of transcribed notes from 50 talks given by Siddharameshwar Maharaj on various themes from Dasbodh. Volume 2 of Amrut Laya consists of notes taken from 88 talks of Siddharameshwar Maharaj where he elaborates on various spiritual principles from three main classic texts; Dasbodh, Yogavasishtha and Eknathi Bhagawat. This text is a great treasure-house of teachings on Spiritual Enlightenment and Self-Knowledge. Siddharameshwar Maharaj gives expositions on many principles of Advaita Vedanta philosophy in a direct and simple language. He offers clear explanations on the nature of the Self [Atman] and Brahman, dispels ignorance with Knowledge [Jnana], and then instructs us to cast off even that Knowledge. Through the power of words Siddharameshwar Maharaj directs the reader to that indescribable Parabrahman which is our True Nature.